A stack of this year's freshman reads. The college common reading program is usually a freshman's first, unofficial assignment. The program is a way schools try to stimulate discussion. Not every school participates in these programs, but the ones that do pick books – both fiction and nonfiction – ranging in topics from race and politics to climate change. Every year since 2010, the National Association of Scholars surveys the schools that pick books. This year, throughout 481 colleges and universities, they found schools were more likely to pick new books over classics. 67 percent of common reading books assigned were published after 2011, according to NAS. The University of Vermont chose a book published three years ago — a deliberate choice from the selection committee. The Vermont state school selected Between the World and Me by Ta Nehisi Coates, NAS's second most popular book of 2017. The book is a letter to the author's teenage son about being black in the United States. A faculty committee hand-picked Coates' book from about 100 suggestions, said Abby McGowan, chair of the school's common reading selection committee. The committee looked for books with beautiful prose, relevance to students across disciplines, strong narrative arc and readable length. Although the college has chosen books from previous decades, McGowan says modern books help students know that "ideas are being created around us all the time." Lone Star Community College in Kingwood, Texas picked 1984 by George Orwell. 1984's return to pop culture repertoire is one reason why LSC Kingwood chose a novel first published in 1949. In January 2017, the work of fiction rose to the top of Amazon's best-seller list. An adaptation of the story later found its way onto the Broadway stage for a three month run, starring Olivia Wilde. "Social media has brought to the forefront how news or history or ideas can be faked or changed," said Darlene Beaman, chair of the school's English department. The book's newfound relevance, she said, relate to recent anxieties around fake news, and has led LSC Kingwood to jump into the conversation. Belmont University, a private Christian college in Nashville, Tennessee, doesn't assign a common reading book. Instead, Belmont has a first-year theme —"ways of knowing"— and picks a group of assignments, like prose, books and a movie, instead of a single book. Freshmen take a first-year seminar where students read classics authors, like Plato, and watch films like The Lives of Others, a movie about surveillance in 1984 East Berlin. "Films are a kind of text that can be understood and analyzed," said Jimmy Davis, chair of the committee that picks the first-year movie. Students "generally aren't accustomed to that." Are you curious to find out what else college freshman are reading? 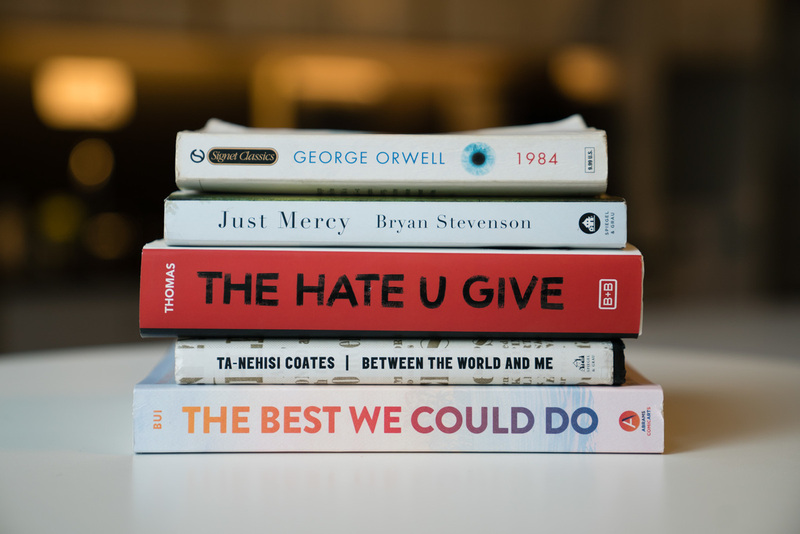 Here are some common reading assignments at a few schools, ranging from a large, public school in Oregon to a small, historically black college in Florida. In her autobiography, Jo Ann Gibson Robinson describes how she and the Women's Political Caucus, sick of segregated public transportation, started the Montgomery Bus Boycott in 1954. 1984 paints a dystopian society in which citizens are stripped of all privacy and "Big Brother is Watching You" always. Protagonist Winston Smith, a Member of "The Party," defies collective values by pursuing a relationship with Julia and faces the consequences of independent thinking. Bui's graphic memoir tells the story of her family in the years before, during and after the Vietnam War. The book was nominated for an Eisner Award, which honors comics. This book was selected under the theme of transborder/transnational, chosen to teach students about refugee and immigration issues, said Julie Voelker-Morris, the school's common reading faculty fellow. Mbue's debut novel tells the story of an immigrant family from Cameroon living in New York during the year leading up to the 2008 financial crisis. Mbue spoke at Simmons College in September as part of their first-year reading program, said Catherine Paden, the school's dean of the undergraduate program. The cells of Henrietta Lacks, a poor black farmer, were used to develop significant scientific discoveries: the polio vaccine, cloning and gene mapping. However, little is known about "HeLa," as doctors referred to her. Science journalist Rebecca Skloot uncovers her story and the history of deeply racist medical practices in the 1940's and 50's. Reyna Grande chronicles her life as an undocumented immigrant in the United States. After leaving Mexico, Grande's idealizations of American life are confronted with reality. She overcomes abandonment, poverty and neglect through the solace of writing. This young adult novel depicts a black 16-year-old girl who is captivated by activism after her unarmed childhood friend is fatally shot by police. Thomas will visit Kansas State University in February 2019, said university spokesperson Cindy Hollingsworth. A collection of vignettes, the book spotlights the journey of finding one's calling — struggles and triumphs included. These short stories range from an ICU nurse in Phoenix to a struggling teacher in Baltimore. Author Dave Isay is the founder of StoryCorps. Just Mercy is the true story of Bryan Stevenson as an idealistic young lawyer. One particular case, the wrongful conviction of Walter McMillian, transforms Stevenson's understanding of mercy and justice.